100 practical ways to improve your business, your team, and your life. Supported by over 30 tools and templates. More than half of all small businesses fail within the first five years. Starting and running a small business is hard work, and many entrepreneurs feel they must do whatever it takes to succeed, at the expense of their family, friends, and health. Yet, if done correctly, small-business ownership can—and should—balance profitable operations with personal fulfillment. According to author Tom Salonek—founder and CEO of Intertech, a Minnesota-based technology consulting and training firm—this balance is actually the secret to success. Salonek believes that your business should “give life, not take it,” a philosophy that has helped him grow his own venture every year since its inception in 1991. 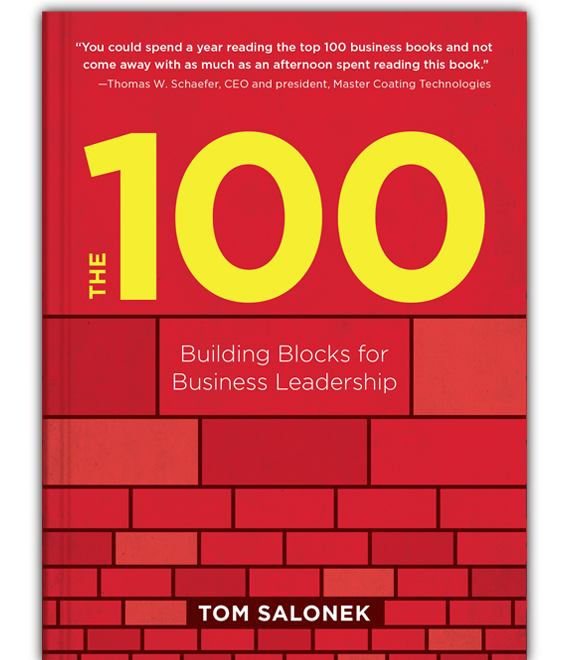 In The 100, Salonek shares his secrets to business success in the form of 100 concise, nuts-and-bolts lessons for achieving the ideal work-life balance for maximum success. Written in clear, direct prose, these lessons are packed with actionable ideas and practical advice for using communication, collaboration, and technology to help small-business owners cultivate the best qualities not only in themselves, but in their employees as well. Whether you own your own business or are simply thinking of starting one, this book will help you inspire teamwork, meet client expectations, clarify your personal values, and create a company culture to match. 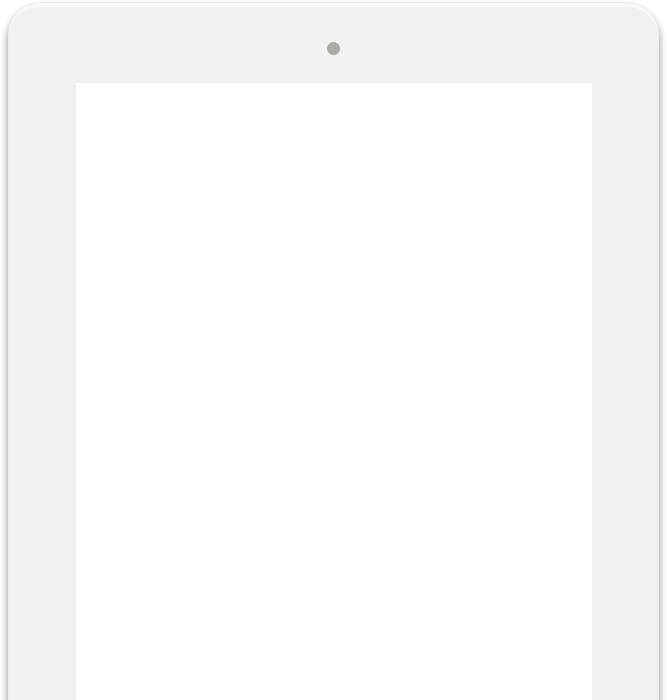 In addition, readers will gain access to a plethora of downloadable online resources—checklists, worksheets, templates, and more—to help implement the book’s ideas. The 100 is a handy, inspiring addition to any business manager’s library. Each chapter contains clear, to-the-point sections that share practical and implementable ideas to improve your organization and your life. The purpose of a successful business is to give life, not take it. Understand how to define and create your best future. Engagement results in more profit and fewer hassles. Use this chapter to create it in your organization. A world-class team starts with hiring. Find out field proven practices for hiring and on-boarding new talent. Discover the key elements required to effectively lead others and how to handle a bad fit. Use these tools, templates, and guidelines to state your business plan—from mission to 90 day goals—in one page. Learn the five core elements for creating a high performance team. Identify vendors and consultants who’ll go the extra mile and learn how to effectively manage the relationship. With a series of Agile tools and best practices for leading people and projects, see how to over-deliver, on-time. Discover the seven things all great leaders do and behavioral science backed communication strategies. Find out how to use well scheduled and managed meetings to make them a freeing, not stifling, way to run an organization. Problems are a sign that you and your organization are alive! Learn the best way to deal with issues. “Not everyone can do great things,” but we all can “do small things with great love.” Make the organization bigger than itself. Learn how to best use the 30+ downloadable tools to make The 100 have a huge impact on your firm and your life. "An entrepreneur’s guide to freedom of time, money, purpose, and relationships . . . the bible of business best practices." The Reviews Are In — Read More! Tom Salonek earned a bachelor of arts in Quantitative Methods from the University of St. Thomas, where he has also served as an instructor. He performed graduate work at the University of Minnesota’s Carlson School of Management. He has completed executive education at the Harvard Business School and the Massachusetts Institute of Technology. The Minneapolis/ St. Paul Business Journal named him one of Minnesota’s top 40 business leaders under 40. His firm has won over 50 awards including being named one of Fortune magazine's 2016 Best Places to Work in Tech. He was named the 2017 Business Builder of the Year by Upsize Magazine. In 2003, Salonek founded the Intertech Foundation, which financially assists families with critically ill children and funds a college scholarship for students interested in studying computer science. 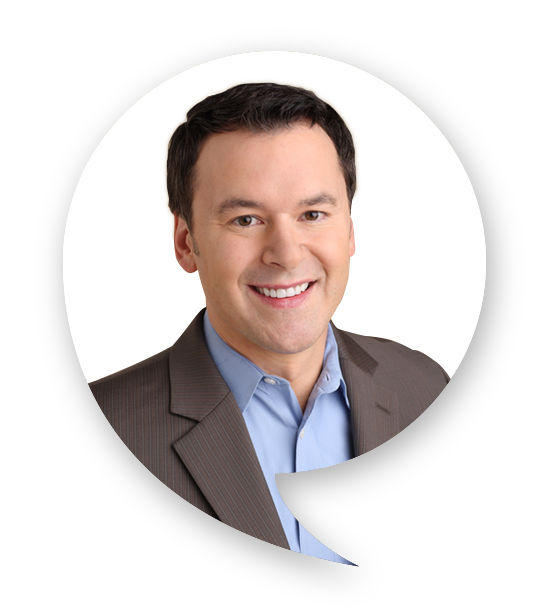 He is the author of three books and has also published more than 100 articles on business, leadership, and technology in newspapers and magazines including the Star Tribune, Minnesota Business, and Upsize. He blogs at TomSalonek.com. He lives in St. Paul with his wife and two children. Tom delivers a keynote at an industry conference. Request Tom to talk at your conference or company. 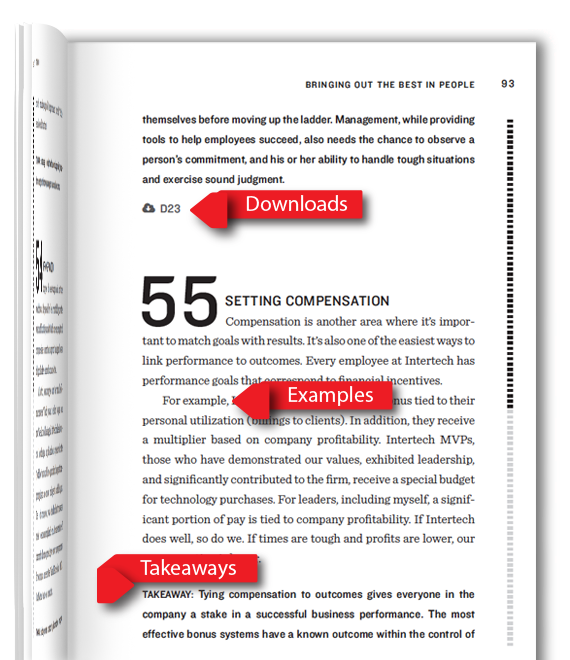 Easy to understand Downloads, Examples, and Takeaways that help you build and run a successful company that keeps your employees and family first! About The Company	- Intertech, Inc. The 100 has been in the making since I founded my company, Intertech, in my basement in 1991. I don’t mean that I’ve been actively writing the manuscript all this time, but I have been learning—both formally and through experience—about what it takes to run a successful business. Some of the ideas I once held have been abandoned after experience taught me a better way. Other strategies have been strengthened and honed based on invaluable feedback from my partners, advisors, and employees. I’ve also learned valuable lessons from graduate-level classes and from the esteemed professors and fellow entrepreneurs I’ve met through executive education programs at the Harvard Business School, the Massachusetts Institute of Technology, and the University of Minnesota’s Carlson School of Management. This book is practical and is meant for anyone leading a team or business. I’ve included lots of hands-on techniques, tips, and management strategies. The book also reflects my personal vision and values, both of which are essential to how Intertech operates. Again, let me be clear: I’m not saying my way is the only way; I’m simply saying that every business must be grounded in a clear vision and compelling values to truly build employee engagement, and, ultimately, success. I’m certainly not a Stephen Covey or a Peter Drucker, but I have seen firsthand how effectively these strategies work at Intertech. Intertech has received more than 50 awards: for being one of the fastest-growing firms in America; for being one of the best places to work according to the Star Tribune, Minnesota Business magazine, and the Minneapolis/St. Paul Business Journal; and for excellence in our management practices. But the real proof of our success is that Intertech has an abundant roster of highly satisfied repeat clients, great employees, and a consistently profitable bottom line. As an entrepreneur operating a successful IT development and training company, my experience includes work with many different employees and Fortune 500 companies, governmental agencies, nonprofits, and a good number of small- to medium-sized firms. In thinking about this book, I realized that despite their differences, all these organizations (including my own) are facing the same profound challenges. The Internet of Things promises to transform (and is already transforming) every aspect of business and customer expectations. The global village predicted by Marshall McLuhan in Understanding Media grows smaller with each passing day, while social media makes it easier for a single unhappy customer to do extensive damage to your brand reputation. On the employee side of the equation, things also are changing rapidly. Millennials are motivated much differently than employees of the past. Research says they will change jobs almost three times more than their baby boomer coworkers, are not interested in long-term employment, and are as equally committed to their work as to their employer (Lyons, 2012). Things are changing! The upcoming workforce is a generation unlike any other and will transform how we attract and retain talent. Our competition can come as readily from Bangalore as from our backyard. And a frequently uncertain economy makes forecasting and growth challenging, at best. Ironically, I believe all these changes are good in the long term. They force us to get better at serving our customers and employers, cultivating our employees (and ourselves), and understanding our markets. In essence, they compel us to build the strongest organizations possible to compete in the largely uncharted business waters of the 21st century. All resources are available for download. innovation, quality improvement, and service excellence. In workplaces where such behavior becomes the norm, the benefits multiply quickly,” he also notes. Intertech consultants truly embrace the “one team, one dream” philosophy, and our company continues to grow and thrive as a result. We do not tolerate ego-inflated superstars who think only of themselves, to the detriment of customers or fellow consultants. We only hire professionals who understand the value of pulling together, like crew members of a rowing team, with corresponding positive results. TAKEAWAY: It’s easy to stop one guy, but it’s pretty hard to stop 100. Tom Salonek founded Intertech, Inc. in 1991, growing it from a one-person shop to the largest combined software developer training company and research-supported consulting firm in Minnesota. Intertech has been featured in stories in Fortune Small Business, Forbes, The Business Journal, Twin Cities Business, Upsize, Ventures, Star Tribune, Pioneer Press, and Inc. Intertech has won over 50 awards, which includes being named one of the 30 Best Places to Work in Tech by Fortune magazine.